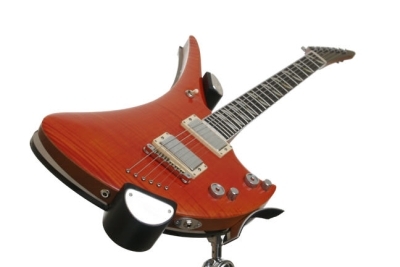 Ergonomic Guitar Design – Why The Resistance? Browse: Home / Ergonomics / Ergonomic Guitar Design – Why The Resistance? According to the National Pain Foundation’s Mayo Clinic Glossary, ergonomics is “the science of designing the job to fit the worker, rather than physically forcing the worker’s body to fit the job.” From the perspective of ergonomics, there are clear opportunities to improve guitar design in order to accommodate the way our bodies work. However, the problem does not lie in insurmountable engineering or design challenges – there are many examples of ergonomic guitar designs as well as improvements for existing guitars. (See below for Related Posts). The real issue is acceptance. The Ergoweb article Ergonomics Helps Music But the Players Prove Reluctant touches on musicians’ resistance to change, concerns with image and ongoing efforts to change attitudes. Robert, I’ve just posted a piece over at thumbrella about your site. Also, didn’t Adrian Legg originally have an Ovation guitar that had a cutaway? Gary – Thank you so much for the write up! From my research, Adrian Legg played one of the round back Ovations before turning to the custom ergonomic guitar he now uses. I own a lower end Applause model that is very similar. I like the tone but the round back is not particularly ergonomic. It takes some adjusting to compensate for the bowl in the back. After being fascinated by the design of the Ovation Breadwinner and Adrian Legg’s funny looking “kleinish” guitar, this page has been great to read. Thanks for sharing all of this with us. Matt – I’m glad you’re enjoying the blog. I’m a techie by trade so I’m enjoying developing it from both a content and design perspective. I have more to come so stay tuned! As far as Scott French, I love his work. His designs are both subtle and beautiful and I’ll definitely take a closer look at his SF3 model. Cool blog! I recently picked up Tim Miller’s “Trio” CD. I love the tones he gets from his Klein guitars. Check it out if you haven’t already. rich – Thank you for stopping by! I’m not familiar with Tim Miller’s work but will certainly look into it. Thanks and stop back soon! I own one of their other models – the Pro-Series – and whilst it has a knee rest, I have to agree that that lack of picking arm support just feels wrong. GL Wilson – I’m so glad you brought up the Traveler Guitars. I was actually looking for more information on those. It looks somewhat similar to the Steinberger “broom” shape which I find sits great in a classical position but lacks any kind of right arm support. So your saying that the small support structure on the Traveler guitar body isn’t enough. What do you think the issue is? Two thoughts come to mind. First, it may lack sufficient surface area to feel like solid support. Second, it may be placing your picking arm at a poor angle relative to the top of the guitar. I’d appreciate your feedback. Robert, my Traveler is the Pro-Series model – it doesn’t have the arm support. However, the Speedster model does. So, unfortunately, I can’t comment… I just wondered if it woul dbe of any interest. Oh, and another link for you – if you’ve not already seen it – Burrell Guitars – these guitars are ergonomic in that they have curved bodies to fit around the player – the range is mainly acoustic too! They look amazing. (Apologies if you’ve already mentioned these). GL Wilson – I came across the Burrell Guitars early on in my search for information on ergonomic guitars but I appreciate the reminder nonetheless. Up until now, I’ve focused primarily on electric guitars but I will start to put together some posts on acoustic models as well. There are several I’ve come across so far. Thanks! Robert, something else for you. Fanned Frets- fanning scale: long bass , short treble. can’t find a whole lot on the ergonomics, but it is mentioned as an advantage in a few articles. Matt – I like the idea behind the Fanned Fret concept. The TK Instruments model I posted on actually uses them. I’ll be posting on it as well as several other neck related ergonomic elements I’ve come across. I have a few interesting related bits about Fanned Frets in particular. I seem to be the top blabman around here! 😉 You’ve mentioned earlier that you wonder how a Klein KX bass body will suit a guitar. I doubt it. When looking at ergonomic instruments, basses seem to differ in large part of the body design. You simply can’t put a bass length string and neck on the same piece of body as a 6-string guitar. On regular guitar bodies, that seemed OK, just a little bit larger in size that’s all. Remember, that Steinberger original “broomstick” graphite bass AND guitar was just like that. Same kind of “body” but just longer scale length and a bit longer “body”. One could dissect and do a forensic on what differs a bass guitar from a regular guitars body when it comes to ergonomics, and why. Steinberger eventually shifted gears. They started making them with bodies. Wonder if ergonomics came into consideration, or just design aesthetics? Maybe both? My personal opinion: When standing up, I think a bass is more ergonomic when held low. The picking fingers hangs down in a more straight angle anyway, and the fretting hand has less distance to travel from right to left, and your view is more “overview” in terms of that the whole length of string is more “viewable”. If it’s higher up, you have to “reach” to the far right and far left more. BUT, this low slung bass, inhibits thumb, slap and pop playing to a great degree! But on a guitar, this low slung thing is totally out of question. You can barely play ANY chord, save for a few simply riffs. I think the crux of the biscuit is if/or the elbow joint point and how much/little you have to bend it. On both arms actually. Bassist wants a chunk of body to rest their picking arm elbow on, which is helpful when “funking” around with thumb, slap, pops. Also, there seem to be more daring design in the bass world as opposed to the guitar world. These outrageuos designs by Auserwald, BassLab (German of course) and more with their extra rod conneted to the neck of the bass, is way avant garde, but I doubt that it has to do with ergonomics. Keep the comments coming Mats. Excellent input and ideas! 1. Does anyone knows of any BLIND Klein – or other ergonomic axe – player? I thought about this, since Jeff Healey passed away, that blind people couldn’t give a **** about what a guitar looks like. Or if blind guitar players EVER cared about ergonomics. In my view, they OUGHT TO KNOW BETTER than the rest of us. Because feeling is all what they got. If they care at all. I mean, if it has been handed over a Klein to a blind guy that shoved all his other axes and started to play that one instead. Or ANY OTHER ergonomic guitar. I have a strange suspicion that if anybody can tell us secrets about ergonomics, it is them. We can’t tell if the way Jeff Healey played was due to ergonomics or not. If it was just “natural” for him to have it on his lap, or that he just didn’t knew. They choose instruments – definitely – from a whole different standpoint than us seeing people do. @Mats – An interesting idea. If nothing else, blind players may bring a bit more objectivity to the discussion. However, I haven’t come across any blind Klein or other ergo axe players yet. Yeah, that’s what I meant, bringing some kind of objectivity to the discussion. As for blind people discovering this site or anything else on the internet I have my doubts. I know, there’s “soundpages” and helpers inside windows that can help and read out what’s written, but anyway. @Mats – I’m with you on the objectivity aspect. As for this site, it’s well indexed by the search engines and I’ve tried to keep the site as accessible as possible. For example, text can be read by search engines or tools for the visually impaired and even images have a description. Ultimately, its a matter of folks looking for our subject matter. Meanwhile, I continue to watch out for guitarists who play ergo instruments.